Metal drains have the KOHLER logo imprinted on the flange. The coordinating strainer has round holes. The bottom of the strainer contains an o-ring to seal the drain when in the closed position. 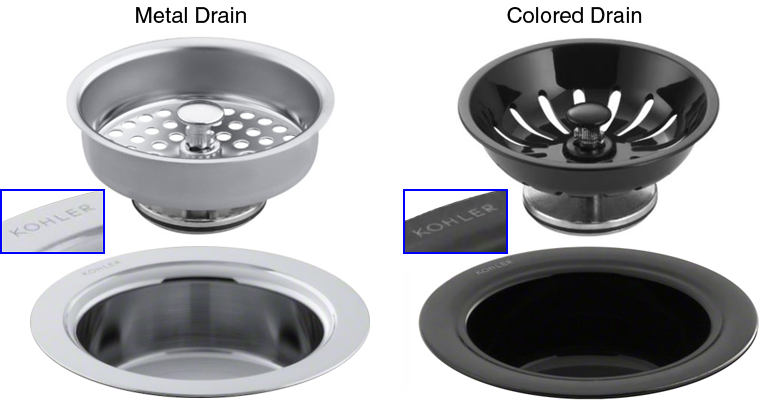 The flange part of a colored drain is made of metal and has the KOHLER logo imprinted on it. The coordinating basket strainer is made of plastic and has slotted holes. The KOHLER logo is imprinted on the flange.